One of the best things you can do for your finances is to have a plan. The right plan for your money can help you achieve financial freedom, and ensure that you have the money you need for the things you want. If you are trying to figure out what you want to accomplish with your money, you can gain a little clarity with the help of financial mission statement. 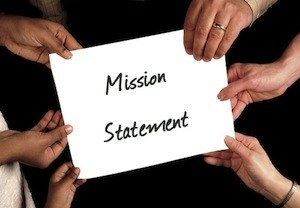 What is a Financial Mission Statement? Your financial missions statement should provide you direction with the way you handle money. It should establish your financial priorities, acknowledge the poor money habits you want to overcome, and state a course of action to help you get to where you want to be. A financial mission statement should quickly state your end goal, as well as how you plan to reach it. The language should be motivational and action-based, helping you visualize the outcome of your financial efforts. 1. What do you want your money to accomplish? Your first task is to decide what you want your money to accomplish. Consider your lifestyle, and what you want your future lifestyle to look like. Do you want to pay down debt? Would you like to secure your retirement? Money is a tool that can be used to enhance your life, and it’s important to view it as such as you put together your financial mission statement. So, if you want a secure retirement, this portion of your financial mission statement should address this goal. The same is true if you want to pay down debt, travel, save for your child’s college education, and give to charity. 2. What steps will you take to accomplish the desired outcome? Next, think about what you will do to accomplish your desired outcome. Consider your values as you list the steps involved in reaching your goal. You don’t have to go into great detail in your financial mission statement, since this is just meant as a reminder, and a motivational tool. But you should list some general things you can do to reach your goals. Once you have these things in mind, you can combine the two sections into a financial mission statement that can provide you with direction. As you put together your financial plan, or as you make spending decisions, you can refer to your financial mission statement for guidance. It will help you stay on track, and remind you about what you think is important. As a family, we recognize the importance of living life on our own terms, and spending money only on what find worthwhile. We will strive to give to charity while investing money for a financial future that includes lifelong learning for all members of the family, and time for travel and hobbies. We will live within our means by cutting spending on unimportant items from our lives, and use our money to help others, and buy experiences and things that we know will enhance our lifestyle. You can see that the basic principles governing our spending habits are set forth. If we have questions about what to do with our money, we can be reminded with the help of this financial statement. A few years ago, the statement might have been different. When we still had large amounts of consumer debt, our financial mission statement (if we had one then) would have started out with an acknowledgement of the problems related to debt, and the way it was holding us back, and the steps we would take (cut spending and increase income) to get rid of debt and begin building wealth for the future. Do you think your household could benefit from a financial mission statement? What would you include your financial mission statement, and why? I’m a 28 year old, who is having a financial problem. I don’t know what to do or where to get money to pay my accounts.. Please help me I really need it the help.